Looking for a nice, long, full-day bike ride, I decided to follow in the footsteps of some other riders and see what the road between Loma Prieta and Mount Madonna held. It looked like I could get there and back in about 65 miles, which is a long ride for me on a mountain bike (especially considering the climbs), but in the range of feasible. Yesterday dawned clear and warm, and I hit the road at about 9:30. I went through Los Gatos, smelling and envying breakfast at Southern Kitchen and becoming aware of the kerfuffle about Dittos Lane. I went up the Los Gatos Creek Trail and past the Lexington Reservoir. From there it was up Old Santa Cruz Highway to Summit Road. The defining characteristic of this part of the ride was that I was frequently passed by road bikes (not in itself unusual), all of whom were women. It takes me a good two hours to get up to Summit Road, and I got to the Summit Store right around noon. Perfect. The Summit Store was busy with bike riders, Girl Scouts selling cookies, and a weekend motorcycle gang (who bought a lot of cookies, I noticed). I had a lovely sandwich (a Full House, with turkey, avocado, bacon and mayo) and a rest. It looks like I spent a half an hour lounging on the patio. Well rested and with a worryingly full belly, I started up Loma Prieta Avenue. Despite the beautiful day, and the many riders I'd seen so far, once I left the Summit Store I didn't see another bike rider for the entire rest of the day. Odd. I've described Loma Prieta Avenue before, but to recap: After a mean bump at the beginning, the road is straight and increasingly steep. The steepness is emphasized by the straightness of the road, I think -- you get the impression that if you stop pedaling, you'll roll back to the store. After climbing from 1600 feet at the store to about 2000 feet the road starts winding, and you see a sign telling you that the road forward is unmaintained. Up to this point the road has been on a ridge, but now hugs the southern flank of the hill as it climbs to 2400 feet and the end of Loma Prieta Avenue. 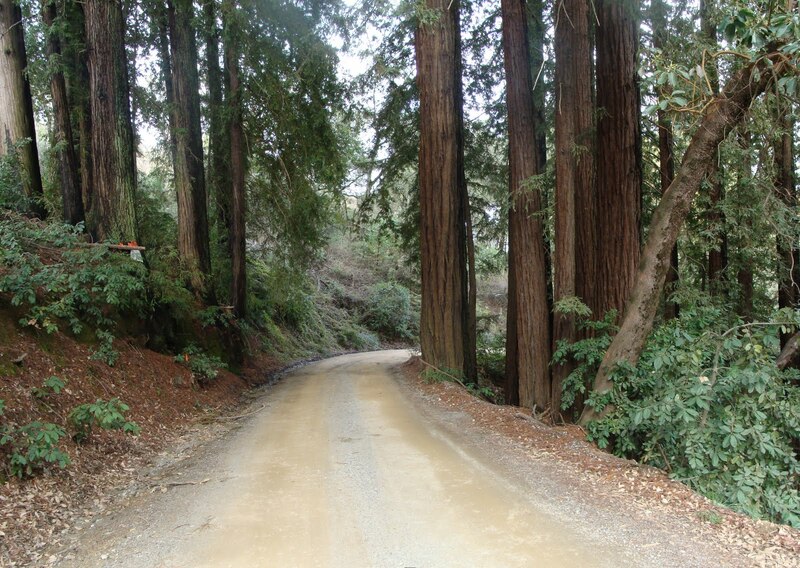 A short dirt track takes you from the end of Loma Prieta Avenue down 100 feet to Mount Bache Road. In my case, I was joined by a pair of barking dogs for most of the trip. The naming of roads, much like their maintenance, is lackadaisical up here. I ran into a utility van trying to find a residence on Loma Chiquita Avenue, and Google Maps was telling him it was near this intersection with Mount Bache Road. This particular Loma Chiquita was, he said, a map phantom, so I told him that there was another Loma Chiquita that started near the Loma Prieta summit, past only two "no trespassing" signs. Lots of roads up here are called Loma Prieta something or other, and as we'll see, Summit Road is a popular name. So it was that I went from the end of Loma Prieta Avenue to Loma Prieta Way, which climbs quickly from 2300 to 2500 feet and then levels out for a bit. After the level section you climb 500 feet in a mile, after which the road is level at 3000 feet until the junction of Loma Prieta Way, Loma Prieta Road, and Summit Road. The spring at Loma Prieta? At this point the rational thing to do would be to continue on Summit down to Mount Madonna, but if I've come up this far I'm not going to bypass the peak of Loma Prieta (or as close as I can get, anyway). Plus I had an ulterior motive. So it's up Loma Prieta Road to (near) the peak, then around the west side of the mountain. Although it wasn't hot I had run out of water, and I entertained the idea of refilling at the little fountain that, in my imagination at least, is the source of Los Gatos Creek. I want to be the sort of person who's that resourceful, but frankly even before I got there I had decided that I wasn't thirsty enough to risk it, and in the event the water was barely trickling out. I've been up here twice before. The first time, I turned around and headed back home. The second time, I rode over to Mount Umunhum. This time, I wanted to explore the trail that leads to the other two peaks/antenna farms up here: Crystal Peak and Mount Chual. These three peaks are the tallest in the Santa Cruz range; Mount Umunhum is number four. Google Maps labels this road Loma Prieta Road (again); Bing Maps doesn't include it at all. The trail begins at the northwest corner of Loma Prieta and bends around its northern slope. It therefore is shaded, and retained a little snow from the recent storms. This road offers an unobstructed view of the valley that you don't get elsewhere on Loma Prieta or Umunhum. Unfortunately it doesn't give let you access to any of the peaks; they are all fenced-in antenna farms. So that's four for four: none of the highest four peaks in the Santa Cruz mountains are legally accessible. Looking east from Loma Prieta Road. The trail at right is Summit Road. After getting as close as possible to Mount Chual (and fixing a flat along the way), I headed back to the intersection with Summit Road, and then down Summit Road toward Mount Madonna. Or at least I had assumed it was down. Summit Road rolls a bit, but hovers around 2900 feet for miles. My legs were wobbly already, and this just took the life out of them. Summit Road has some nice views, and proves it is indeed on a ridge by offering views both north and south. One reason those views are so clear is that this area is still recovering from the huge Summit Fire of 2008. The fire, the effort to contain it, and the clean up have left scars up here that apparently will take quite a while longer to heal. Of course it doesn't help that similar fires recur so often. Summit Road is mostly a washboard dirt road, with occasional stretches of crumbling semi-pavement and deep, water-filled holes. Even on the flat parts, it's hard to maintain much speed. Immediately past Maymens Flat Road, one finds an entrance to Uvas Canyon County Park, heading toward the amusingly-named Knibs Knob. Less amusing is the gate across Summit Road claiming the road is private and, in particular, forbidden to bicycles. There is every reason to believe that restrictions like this are generally bogus, but this one is unusual in that it was actually struck down in court. Or so the story goes, anyway. Nonetheless the unwelcome signs remain, and if there's an authoritative source for the court case, I haven't found it (Update: On a great long-time Santa Cruz rider's blog I found a copy of the decision in the appeal, which confirms the openness of the road but with very specific, narrow reasoning). As for the specific restriction on bicycles, well, that just can't be right. I trundled along. Before you even start down Summit Road, you can see a skinny radio tower rising up in the distance. I knew the road passed by the tower, but the problem was that it never came closer. You can see it from everywhere, and it's always in the distance. It's like climbing Mount Hamilton -- you can see the Lick Observatory forever, and you just never get any closer. Past the tower, you finally get to the sort of rich wooded area that you hope for on these sorts of rides. The road bends around a bit and finally starts dropping -- you lose 500 feet in a mile and a half. Shortly after you pass through the signs marking the end of the bogus private road segment, the road becomes real -- paved, a line down the middle, and roughly straight, right down to Mount Madonna County Park. The park itself looks like it probably has some nice trails, but I couldn't tell because they're off-limits to bikes, and my legs were shot anyway. In fact I was too exhausted to really enjoy the beauty of the park itself, although I remember the strong, very pleasant scent of pine that dominated. I rode up to what I think is the high point in the park, where I found no view (accessible to a bike, anyway). I did, however, find a pen full of something called white fallow deer. A marker explained why this park has captive deer; apparently they were fashionable exotic pets at one point, and these animals are the descendants of some deer given by William Randolph Hearst to the estate of Henry Miller (presumably the cattle king, not the writer). By this time the sun was heading down, and I had officially checked off the last goal of this ride. So it was time to head home. I had originally planned to ride up Uvas Road past the reservoir, and back home. But I knew that would mean a lot of up-and-down, so it would take a while. And if it got too dark and I wanted a ride, it had little cellphone coverage and was difficult to get to by car. So at this point, still in the park, I asked my wife to come and pick me up in Morgan Hill. So that's the revised plan -- ride down to Morgan Hill. First, I retraced my steps out of the park, to the intersection between Mt. Madonna Road, Summit Road and Pole Line Road. This is another example of the haphazard road names around here. The road I've been on all afternoon is sometimes called Summit Road, but other times Mount Madonna Road. In fact at one point, the labels on Google Maps cycle several times through Summit Road, Mount Madonna Road and Loma Prieta Way. So the road I want here is also called Mount Madonna Road, but is perpendicular to the one I just came down. It's hard to miss, though -- a huge tree is in the middle of the intersection. Mount Madonna Road (this version, anyway) finally drops off the ridge that I've been on all day. It's a skinny dirt road that drops from about 1700 feet to below 500 feet in less than three miles. I think the grade is about 8.5%, but of course I was descending so for me it was negative, and no problem. On this remote little stretch of dirt I saw no other bikes, but three cars. I hope they were sightseers and not just lost, following lines on a map that seemed like real roads. If they were sightseeing, then this was a nice road for it, probably the prettiest little stretch on this ride. Near the top, the road is enclosed by woods and therefore permanently damp. At one point there was a stream falling down the hill in a series of waterfalls. Unfortunately most of my pictures of it were blurry in this dark little corner, but it was quite pretty. Mount Madonna Road bottoms out on a bucolic road called Redwood Retreat, which follows a stream called Little Arthur Creek to Watsonville Road. By the time I got to this intersection, it was 5:30 and dusk. Watsonville Road has plenty of traffic, a small shoulder, and all the cars had their lights on. Meanwhile I was drained, riding along this (slightly) rolling road with short bursts of pedaling and as much coasting as I could muster. I cursed the occasional headwind. I rolled into Morgan Hill, found a cheap taco place to grab a bite, and waited for my wife to rescue me. In the end I was out for almost nine hours, which might be a record for me. I rode 56 miles, and the Garmin says I climbed 5300 feet. I don't know how accurate that is, but it felt like twice as much. Once I got back I was wondering whether coming down Casa Loma was really possible. The way I was pondering was to continue on the path past Mount Chual, which looks from the satellite imagery like it also links to Casa Loma. So in what way is Casa Loma scary? Steep scary, or creepy back-country they'll-never-find-your-body scary? Hi! I'm a long-time reader of your blog, and I write my own bike blog for the SF Chronicle. I'm working on an article right now about the controversy on public access to Summit Road, and I'm wondering if I could use your photo of the bogus signs? I would credit you, of course. Not sure if you'll see this comment on an old post, but if you do, you can contact me at bkcoyne@gmail.com. Thank you! It's fine to use the images. I've replied through email as well.